I totally jumped on board the matcha trend that’s happening right now. You can find it in every type of drink these days. Just head to Starbucks and check out their various options, not to mention the drink aisle at your local grocery store. Matcha, Matcha, Matcha. So thanks to a friend who cooks and bakes, (way more than I do!!) I was lucky enough to snag a few of his latest creations, matcha marshmellows. Now, I’ve already taken a stab at a matcha cocktail recipe here on the blog, The Matcha Grasshopper, and loved the flavors of mixing matcha and sweet liqueurs… so why not mix matcha with chocolate too?! Below you will find a few fun ideas for what to do with the matcha marshmellow recipe I’ve provided. While you can, of course, just squish them in your fingers and eat them alone, adding them into a few classics is a bit more fun! Combine the sugar, corn syrup and water in a heavy bottomed sauce pan. Cook over medium high heat until the mixture reaches 238 degrees. While the sugar is cooking, bloom the gelatin in a mixing bowl (I do this directly in the stand mixer bowl, but if you don’t have one any large mixing bowl will do). Once the sugar mixture reaches 238 degrees, carefully add it to the gelatin while mixing on low speed with the whisk attachment. Once the mixture is incorporated, increase to medium speed. While the sugar mixtures whisks, in a separate pot heat milk to just simmering then whisk in matcha, vanilla, and salt. Pour this mixture into the mixer while still continuing to whisk on medium speed (you can crank the speed up a bit after it is added). Continue to whisk on medium-high until the mix has cooled and soft peaks form. Pour the marshmallow into a prepared pan and allow to set at room temperature for at least 3 hours, or overnight. (I use an 8x8 disposable tin pan dusted with powdered sugar because you can literally turn the pan inside out to get the marshmallows out. You can use a larger pan for thinner mallows, or a smaller one for super thick ones). Turn out of the pan onto a work surface dusted with powdered sugar. Cut the marshmallows to your desired shapes, dust with more matcha-sugar and enjoy! Break a graham cracker in half and lay the two halves out on a plate. Add a few squares of blonde or white chocolate to the top of one half. Top off with other half of graham cracker. Smoosh together so everything mixes and melts out the sides. Then enjoy a classic s’more! Or throw them in your favorite hot chocolate recipe! And don’t forget, to get creative. 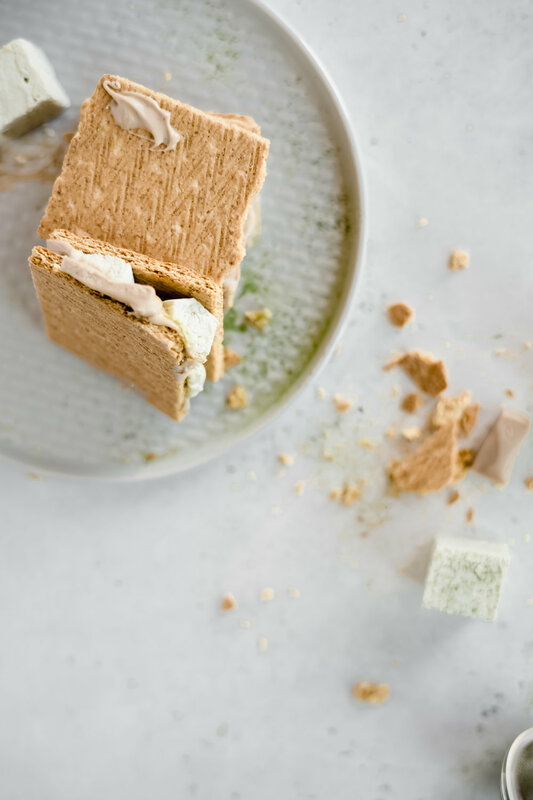 Substitute in these matcha marshmellows in other recipes that use traditional marshmellows. I bet matcha rice crispy treats would be delicious too!